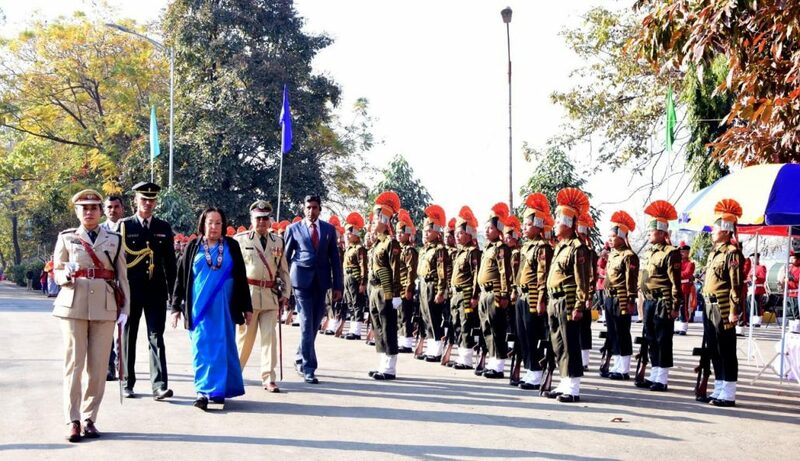 Manipur Governor, Dr Najma Heptulla at the state-level celebration of Republic Day at Kangla Fort . The 70th Republic Day was celebrated across Manipur on Saturday under tight security arrangement in view of the boycott called by banned insurgent groups. The main function was held in the morning at the historic Kangla Fort in Imphal. Manipur Governor Dr Najma Heptulla, who unfurled the tricolour, also took the salute of the parade and the march-past. Around 110 march past contingents including 23 schools, 20 cultural troupes, 18 tableaus and 9 bands representing security forces, NCC, government departments, educational institutions and NGOs participated in the Republic Day parade. The Governor handed over medals to dutiful officials from Home department for gallantry, distinguished service, meritorious service and service for excellence as part of the celebration. The Republic Day function at Kangla Fort was also attended by Manipur Chief Minister N Biren Singh and his Cabinet colleagues, opposition leader and former chief minister O Ibobi and other state officers. The vote of thanks ceremony of the Republic Day celebration was held at the parade ground of 1st Battalion of Manipur Rifles. Chief Minister N Biren Singh in his address said the new government will maintain and promote the hard-earned tranquility in the state. Chief Minister N Biren also reiterated the stand of the state government in connection with the Citizenship (Amendment) Bill. He said his government has been urging the central government to take up necessary steps to protect the indigenous population by incorporating or inserting a clause in the bill adding that the state government will work based on the interest of the public. He also appealed to study the Bill. The district administrations also celebrated the day with respective Deputy Commissioners and assistant DCs unfurled the tricolour and took salute of the march past contingents. Meritorious awards were distributed to the officers and staffs of various departments. Meanwhile, normal life has been severely affected in the border state in view of the dawn to dusk shut down by banned insurgent groups. All roads leading to the state capital wore deserted look since early morning till the filing of the report. The shops, business establishments remained closed. This time five civil society organisations and students union of the colleges also boycotts the celebration in protest against Citizenship (Amendment) Bill.